Print accompanied by the caption 'Primo Intermedio della veglia della liberatione di tirreno fatta nella sala delle comdie del Ser.mo Duca di Toscana il carnovale del 1616 dove si rap:va, il monte d'Ischia con il gigante tifeo sotto'; or 'First Act of Veglia della Liberazione di Tirreno represented in the comedy hall of the serene Duke of Tuscany during the carnival of 1616, representing the mount of Ischia with the Giant Tifeo underneath'. 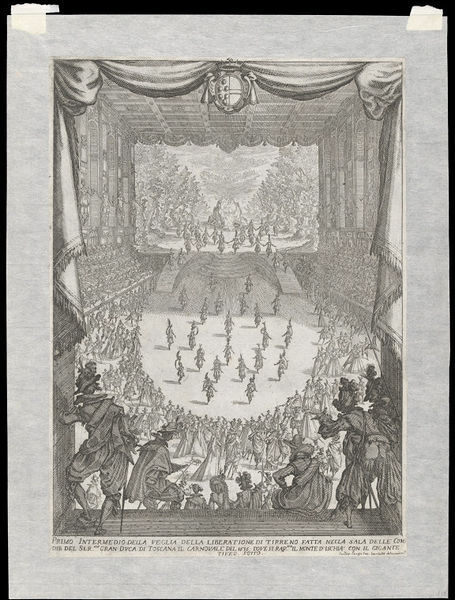 Etched by Jacques Callot. Etching accompanied by the caption 'Primo Intermedio della veglia della liberatione di tirreno fatta nella sala delle comdie del Ser.mo Duca di Toscana il carnovale del 1616 dove si rap:va, il monte d'Ischia con il gigante tifeo sotto'. A scene from the Grand Duke of Tuscany's Festival in 1616. Three Interludes of Florence, represented in 1616 on the theatre of the Grand Duke. Continuation of 3 [? ], the last are extremely rare. Superb [?]. Written in pencil on loose print mount. Written in pencil on back of print sleeve. The liberation of Tirreno and Armea, authors of the Tuscan blood. Written in blue biro on print sleave. Opera developed around 1600. It grew out of the sung and danced interludes known as intermezzi that were performed between the acts of serious drama at the Florentine court. 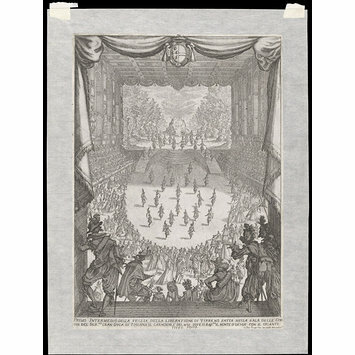 This print records a performance held in the theatre at the Uffizi palace, the stage set with wings and theatrical machines. Since the dancers were usually courtiers, there is little separation between performers and audience.